So far so good on my EUR/AUD short trade! Price has already moved around 150 pips my way and I’m planning to make a few forex adjustments in order to press my advantage while limiting my risk. 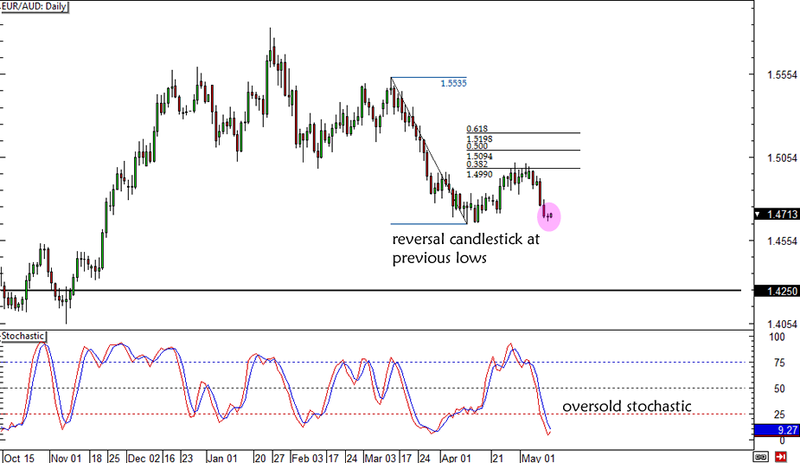 As you can see from the daily chart below, a reversal candlestick pattern has formed right around the pair’s previous lows where I suspected it would find a bit of support. At the same time, stochastic just made its way to the oversold zone, indicating that a bounce could take place. I’m tempted to just lock in whatever profits I have at this point for fear of seeing a repeat of my AUD/NZD short, where my winnings just quickly vanished before my eyes! But, as I mentioned in my trade plan, I will be trailing my stop by 250 pips and adding another position at the break of the 1.4650 lows. Do you think this sounds like a good plan? Or do you have any other suggestions on how I could manage this trade better?